Raymond Coalition for Youth knows the value of connecting resources. We work hard to find community partners that can help connect the community with valuable information and resources. If you are looking for more information on any topic that isn’t listed, we invite you to connect with us and we will work to get that information to you. 2-1-1 NH is the connection for New Hampshire residents to the most up to date resources they need from specially trained Information and Referral Specialists. 2-1-1 NH is available 24 hours, 365 days a year. Multilingual assistance and TDD access is also available. Those outside of New Hampshire, call 1.866.444.4211. Here is a copy of our Raymond Coalition For Youth Community Resources Guide. This information is updated annually to ensure it is accurate and correct. Please feel free to share this guide electronically, or make copies to share. If you would like hard copies for your location please contact our office and we can bring some by. April is Alcohol Awareness month. If you know someone struggling with Alcohol (It is the #1 abused substance) please refer them to The Doorway, the state's new Hub and Spoke system, or have them call 211. If they want local support please call our office and we are happy to help. Learn how the Manchester Central Fire Station is helping individuals addicted to drugs, including alcohol. Got Drugs? Join us on Saturday, April 27th for our BiAnnual DEA National Prescription Drug Takeback event, to keep our family, young people and environment safe by disposing of medications properly and safely. Open to the public! Here is a great video, Tips for Parents about Prescription Drug Misuse. This video is just over 6 minutes long - very informative and helpful. Children's Hospital at Dartmouth (CHaD)'s Teen driver website is www.nhteendrivers.com, and traffic safety website is www.trafficsafety4nh.org. Register for the New Hampshire Traffic Safety Conference 2019, happening Monday, May 6, 2019, from 8:30 AM – 3:00 PM, at Grappone Conference Center in Concord, NH. Stay tuned for more details about this event! Raymond High School Students - Assistance is available to you & your families, right at the school Contact Ms. Gina Simone, the Student Assistance Counselor, or Mrs. Angela Fallon, the RHS Social Worker. 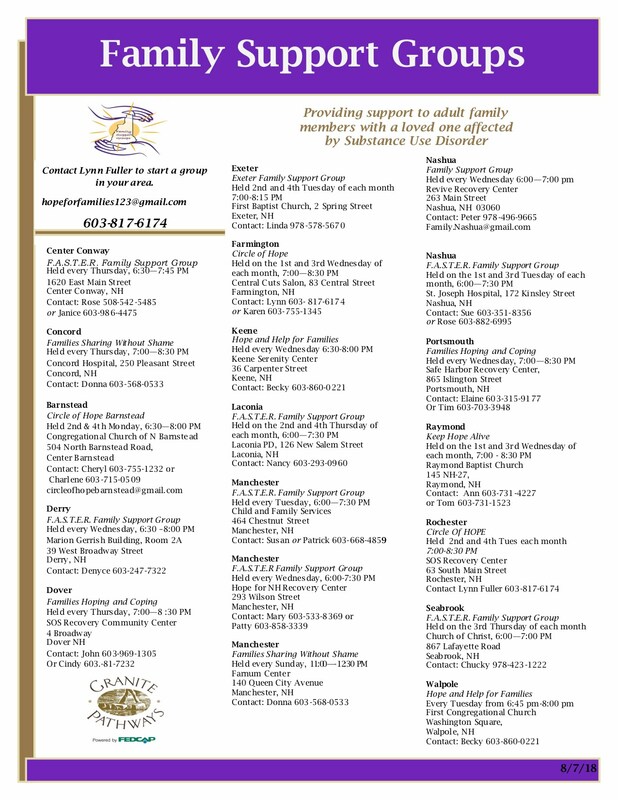 Contact Lynn Fuller, Family Support Coordinator for the state of New Hampshire, with questions, or to start a support group in your area. "Minister Craig" - AKA M.C. Recovery - A local invaluable Addiction Recovery Resource! He is an advocate for Recovery, providing support and ministering, working closely with young people and adults alike. You can reach him via e-mail: MCRecovery333@gmail.com, or call him at (603) 320-0567. New Hampshire Recovery Hub: New Hampshire Recovery Hub is a resource for people who are curious about, entering, or sustaining recovery from substance use disorders. is aimed at assembling all of the information in one spot and letting people know it has the seal of approval from state officials. This website just launched the last week of May, 2018, and is a partnership between Drug Free NH, the Bureau of Drug and Alcohol Services and peer recovery services at Harbor Homes. Is there a young woman in your life who is pregnant and misusing or addicted to opioids? Perhaps it’s your daughter or granddaughter, your son’s girlfriend or wife, a niece or a friend. Here you’ll find information to help her have a healthy pregnancy and a healthy baby. The Truth About ACEs: Learn about what Adverse Childhood Experiences are and the impact they have. View the video presentation from our October 11, 2018, monthly meeting, by the Manchester NH ACERT Team. Children's Hospital at Dartmouth (CHaD)'s Teen driver website is www.nhteendrivers.com, and traffic safety website is www.trafficsafety4nh.org. Register for the New Hampshire Traffic Safety Conference 2019, happening Mon, May 6, 2019, from 8:30 AM – 3:00 PM, at Grappone Conference Center in Concord, NH. Stay tuned for more details about this event! SAFE: Stop Abuse For Everyone, a Human Rights Agency - bringing awareness to underserved victims. Haven NH - Providing support services and prevention education to those impacted by domestic and sexual violence. Narcotics Anonymous (NA): Program focuses on addiction, the obsessive-compulsive behavior and recovery from it, not drug-specific. Call: (603) 645-4777, List of local meetings in the seacoast area. Project Heal: Project HEAL provides access to healing for all people with eating disorders. Children's Hospital at Dartmouth: Teen driver website is www.nhteendrivers.com, and traffic safety website is www.trafficsafety4nh.org. Persist: A support group for pregnant and parenting women in recovery from substance use. This free, weekly support group meets every Tuesday from 9:00 am-10:00 am in Haverhill, MA. Visit their website, or contact 978-992-8010. Addiction Recovery Services – Evidence-based treatment for substance use and co-occurring mental health symptoms. Portsmouth and Salem, NH locations. Intensive Outpatient Programs and Aftercare offered. Crossroads Recovery Center is located in Salem, NH. You can contact their office at (603) 912-4490. You may also visit their website for more information. The Farnum Center: Their Misson - "Helping individuals and families find their way to a life free of the effects of alcohol and other drugs through comprehensive treatment and recovery services open to all." Locations in Franklin and Manchester, NH. Contact: 1-888-840-4243. GateHouse Treatment: GateHouse Treatment is one of the leading drug rehabs in NH. The drug treatment center is located in beautiful Nashua, New Hampshire, conveniently minutes from downtown Nashua. Their drug rehab in Nashua is an intimate setting with very individualized and focused care. For 24/7 Treatment Help, call: (855) 448-3588.